Wisconsin Rep. Paul Ryan has released his new budget to much fanfare (and quite a few expensive videos), but that doesn’t mean people are any more fond of his “balance the budget on the backs of the poor” plan than they were last year. To be fair, the Republicans who voted down Ryan’s plan were actually upset that it didn’t provide more cuts, and that it actually increases the national debt. But when your plan cuts taxes lower and lower for the wealthy and corporations, it’s pretty difficult to find enough ways to balance that out with cuts to the social safety net, unless the GOP actively asks the poor to collect money on the street and mail it to the government once a week. Oh, maybe I shouldn’t give them any ideas. Stacy m. Sorry there was a budget proposal. As my Rep put it, they praised the budget, the men who sponsored it and then they destroyed it. Talking to my 92 year old neighbor about it. She said, "Every time the Republicans get power we have a depression, you watch what happens now. so instead of passing SOMETHING to begin with...the dolts back out with some lame excuse! I am sick and tired of these goons doing NOTHING! At least Ryan put something forth...HAS ANYONE ELSE? NOPE....THE SENATE HASNT HAD ONE IN 3 YEARS! And the slaves of this REPUBLIC sit on their hands whining and hiding on the internet! I am repulsed by the spineless American spirit! IT IS DEAD! This is no longer a Democracy, AND it is no longer a Democratic-Republican party which was organized by Thomas Jefferson in 1792, NOR the Republican Party organized in 1854 to oppose slavery. It has become a Plutocracy. Plutocracy is 1. Government by the WEALTHY. 2. A WEALTHY class that controls a government. 3. A government or state in which the WEALTHY rule. Vote Republican, and you will insure that the WEALTHY have it their way. So he is willing to tear apart the very program that helped his family. They do own a business. It's easy! He's the ONLY ONE holding a budget in his hands! Obama - he don't want no stinking budget! The Democrat controlled senate - they don't want no stinking budget! Show us an alternative budget Robin Marty - and then you can knock Paul Ryan's budget! And by the way - good old Barack has been giving away a fair share to the wealthy and the corporations lately - or have you conveniently not noticed? Paul Ryan bought and paid for by the health insurance lobby among others. His budget lower taxes for the rich, increase the defense budget and to hell with the old, sick and infirmed. They are only usleful if we canforce them to pay more to the health insurance companies. Time to replace Paul Ryan. I hope my family members in Wisconsin and their neighbors will consider voting for Rob Zerban. I should have added the fact that Paul Ryan and his cronies work, they work for the downfall of a free nation. They work for the rise of Corporate America which is good for the 1% but bad for the other 99% of Americans and the world. These people give new meaning to the words greed, immoral and unethical behavior. These people ARE the DEATH PANELS and only the rich will escape it. What this idiot is describing is a kind of death squad. On the one hand assisted suicide will be illegal but health care will be denied to many in the end. Abortions will be unattainable but once that baby is born they wont care is they live, die OR even if they go to school. If these people are truly religious I have to wonder if the God they worship has horns, a tail and thinks the deserts are to cold. John D. Rockefeller said, I dont want a nation of thinkers, I want a nation of workers. Well he must really love Paul Ryan and the rest of his cronies. Paul B.: it is the end of the week, a week chok-full of stupid talk and ignorant claims from you rightwingers. So let me put it bluntly: you are an abject uberpartisan MORON for believing: "the way to increase jobs is NOT through DC stimulus to political cronies as most administrations do, it is through private investment, private capital, new businesses, expanding business that happens outside DC influence and control." as a way out of our flirt with a [R] economic depression. So just who will be buying from all these shiny new businesses? All the people out of work, all the people with work but with tight budgets and fear of losing thier job next? 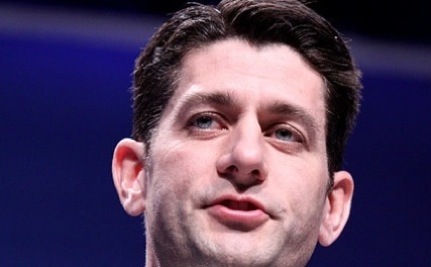 Rep. Ryan is the gift that keeps giving-to the Democrats ! His earlier budget is overwhelmingly opposed by the public and this one may be worse !